Sarajevo is the capital of Bosnia and a fascinating and beautiful place to visit. It has a rich and tragic history that makes it a unique place to visit in Europe. It has unique architecture, an interesting culture, and excellent food. If you're traveling independently to Sarajevo, the most interesting part of the city is the old town. You'll find some great hostels and hotels in this area and it won't be long before you make a few friends. How much do hostels in Sarajevo cost? Travellers Home Hostel is an award winning hostel in Sarajevo. 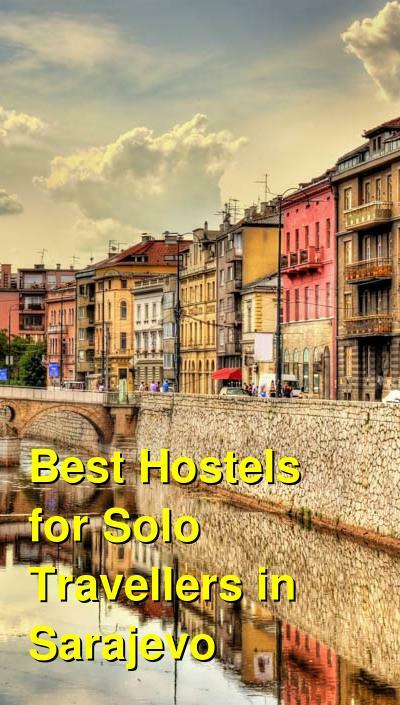 It's a favorite among travelers of all types, and if you're traveling alone, you're sure to appreciate the hostel's great atmosphere and good amenities. The hostel is located in a restored Austro-Hungarian building. It's in the center of the city and is close to many interesting places including restaurants, bars, and cafes. Despite its close proximity to everything, it sits on a quiet street where you can be assured a good nights sleep. The staff at the hostel are friendly and knowledgeable of the city. 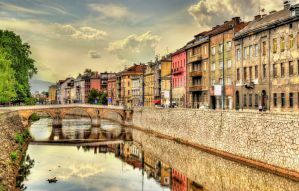 They can tell you about any local festivals or events that might be going on or any local restaurants where you can sample Bosnia's delicious cuisine. The hostel has both private rooms and dorms available. Private rooms can sleep either two or three people, and dorms sleep up to eight. Rooms are very clean with new furnishings and the atmosphere is cozy but comfortable. This hostel is a great option for travelers headed to Sarajevo. It's located in the center of the city's Old Town, near Fra Grga Matic's square. It's very close to many of the city's most famous monuments and landmarks. If you want to be in a convenient location where you can walk to many attractions and restaurants, then this is a good option. The hostel has a homey atmosphere and the staff is friendly and welcoming. The rooms are comfortable and the furnishings are nice. Amenities available to guests include a shared kitchen, a pleasant living room, and safety deposit boxes. Although the hostel itself is on the smaller size, the rooms are comfortable and the staff keeps the facilities very clean. Dorm rooms sleep between six and eight guests. If you're looking for an affordable option in a good location, then this hostel can't be beat. The Doctor's House is a unique and quaint hostel in Sarajevo. It's located in a large house that is right behind the Sarajevo Cathedral. It's owned by fellow travelers and has all of the amenities any guest could need. Dorms are equipped with privacy curtains, reading lights, and personal chargers on every dorm bed. There's wi-fi throughout the hostel and laundry service available. There's also a shared kitchen with many supplies that you can use. If you're traveling alone, it has a great set up for meeting other guests. There are several great common areas that are both indoors and outdoors. The hostel organizes regular events for guests including weekly activity nights and regular barbecue nights. If you're looking for travel information, the staff can give you their perspective on off the beaten path locations. If you want to see Sarajevo outside of the tourist attractions, then they can tell you the best bars, restaurants, and entertainment venues. Before you leave, you'll fall in love with the city and make it your own. Another conveniently located hostel in Sarajevo, Residence Rooms is walking distance to many of the city's most popular attractions. It's located in the city's Old Town and is near the Museum of Literature, Beys Mosque, and the Old Orthodox Church. There are also many great restaurants and cafes in the area. The hostel is housed in a 105 year old building that has a lot of character. There are several nice common areas including a music lounge and a television room. It's the perfect place to relax after a busy day exploring the city. If you're looking for some peace and quiet, there's also a nice reading area where you can enjoy a good book. If you're on a particularly tight budget, you can use the hostel's shared kitchen to prepare your meals. The hostel is kept very clean and the furnishings are nice. The atmosphere is pleasant and this is a great hostel to meet other guests. Both private rooms and dorms are available that range in style and cost. Regardless of your budget, you will likely find a room that meets your needs at Residence Rooms.